I’m Manos and this is my blog which is all about creating and sharing (free) stuff for developing websites. Updated Page scroll to id for WordPress to version 1.6.4. Updated Page scroll to id plugin to version 1.5.9. Last updated on Jan 23, 2011 Originally published on September 8, 2010 by malihu, under Templates & web apps. A fullscreen image gallery made with jQuery and CSS. 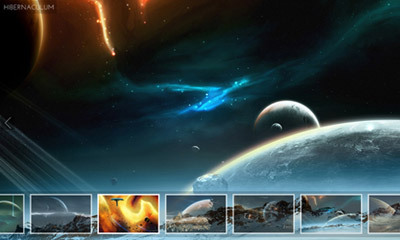 The gallery features fullscreen images in various modes and custom thumbnail scrolling script. The gallery was made by a combination of some previous scripts and tutorials posted on this blog. The images used on the demo are artwork of Tobias Roetsch. I’ve included the complete gallery code on page 2 of this post. This work is released under the MIT License. You are free to use, study, improve and modify it wherever and however you like. Thanks for the code it was really helpful, But is there any way to make the transition to next image little more animated or smooth so that the black loading screen doesnt show up… It will look much smoother if the next image transition becoms little smooth and eye catchy. Could anyone plz help me out.. tried my brains out but couldnt figure it out.. I have an album with 300 images in it. It is undesirable to have that many images to scroll through on one page. Is it possible to have buttons somewhere on your fullscreen Image Gallery page, say top right, which link to pages within my album. Say, for example, five clickable pages with 60 images for each gallery of the album? I have read through the hundreds of comments and saw that you had planned to do something like this back in 2012. Did you manage that? I hope you have time to reply to this comment and possible have a solution for me. Tried to edit my comment, but couldn’t. I meant a drop down menu on the top toolbar, where I asked for ‘buttons’. The clicked-on image is the current image on returning, courtesy of a php session variable. Thanks for sharing. This image gallery looks great and very helpful. Here is another one tutorial for ligthbox image gallery using bootstrap and jquery. How do I adjust the JS code? Thanks for this, finally a gallery that (after a bit of finetuning) can be turned in the minimalistic gallery I’ve been after for quite a while. I’ve taken the liberty to adjust the index page to include some php code, so no adjustments have to be made to make a new gallery. This presumes the thumbnails go in a folder ‘thumbs’, which I personally prefer, becuase they can have the same names then. But this of course can be adjusted to whatever one prefers. HOW to go to a specific slide through text links? Thanks for sharing your great work. It seems like there is an issue that the last thumbnail doesn’t appear properly. I modified the code below, and it works fine now. Thanks for the plugin and thanks in advance for your support. Hi, Awesome slider and thanks for sharing. Isn’t possible to add “play & pause button”? I’m use this to creating my photo gallery. Hope you can help. GREAT CODE! , one question, it’s possible center thumbs, my gallery it’s only 3 photos, thks!!! Hello ,plzzzz help me out .I had used yor Excellent Template for my client .but as if not I cannot able to connect Contact Form Directly to Email,Outlook is opening..Plz help me out.. This is an awesome blog post, this image slider looks just awesome that I created and put on my site. It would be nice if you can have a link to every image in the gallery, because there is only a link to the gallery, but a link to single images would be nice. This is NOT fullscreen like I hoped! It’s merely full window. Dissapointing! How do I hide the thumbnail completely? Remove it from the entire slider altogether? Also, is there anyway to enable Autoplay within the script? Is there any way to check if an image comes in vertical format and then bypass the image scaling block so such images will be displayed fully (not scaled)? Hello Malihu, first of all, thanks. I mixed version 1 and version 2, but I’m having an issue with the “bgimg” display tag, when I load the website or click a thumbnail, the style gets to “display:none;”. Is there a way to fix this within the “gallery.js”? When an image is clicked it doesn’t fade in or fade out, just quick change. Where in the code can I check this, thanks. Is there any way changing the size of the thumbnails?? You can use Css for it. Hi there, great work on this gallery. The only thing I find that would make this really perfect is the ability to sort the images. Right now I find that they are displayed based on file name and not based on the order in which they were added. Is it possible to make the images display in the order that that they were uploaded? ie the latest images show first and the older ones display later? Thanks in advance. I have tried to create a separate JS sheet for this great design – but i cannot separate the code from the html page and keep it functional. Wanted to use in multiple pages with one js sheet download for efficiency. Can the js code be done in a separate .js sheet? And yes I have deleted the in my attempts – nothing but js code on the page. In my attempts – the scroll bar appears but not the background image. Tried it – could not get it to work – have you tried this? If yes, and it works let me know I will happily retry. I modified the code so I could have the large image link to a specific page based on a custom attribute added to the thumbnail image (attr = data-link). Is it possible to have more than one gallery on the same site… is there a good solution for this… ? Is it posible to obtain the images path from a sql database? I already resolve how to get the path from my database and use it in the img, when I click on the next button change to the next picture, when I get to the last picture and click next it show me the first picture but when you click next again show the first again and again. You can set the $defaultViewMode to “normal” or “original” in the first line of the script. thank you for the answer. I was more referring to a case, where we have 10 images in the gallery 8 are big enough to be fullscreen, but 2 are small (800×600). Choose the Mac apps you like for one low price! Unbelievable discounts for Mac users, creative professionals and web designers. Manos Malihutsakis blog. Creating and sharing (completely free) all kinds of web stuff.